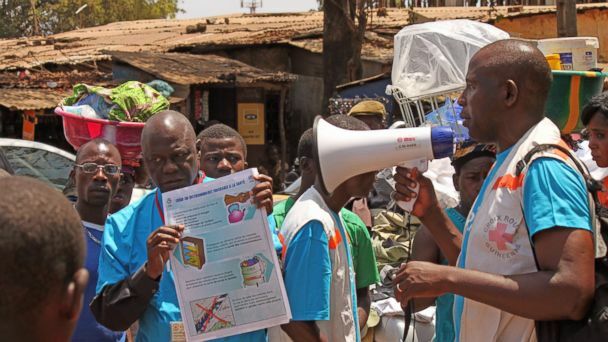 An Ebola outbreak that has killed at least 78 people in Guinea, Liberia and Sierra Leone could land in the U.S., health officials warned today. Symptoms of the disease, such as fever, red eyes and bleeding, can take up to three weeks to appear - ample time for an unwitting victim to travel outside the West African hot zone. "It's true that anyone with an illness is just one plane ride away from coming to the U.S.," said John O'Connor, spokesman for the U.S. Centers for Disease Control and Prevention. "But we have protections in place." Airline workers are trained to spot symptoms and quarantine officers at 20 major U.S. airports like New York City's JFK are ready to respond to an in-flight illness. The CDC has also deployed a five-person team to help contain the outbreak on the ground in Guinea, O'Connor said. They arrived Monday night. "There's nothing to prevent someone traveling here asymptomatically during the incubation period," said ABC News' chief health and medical editor Dr. Richard Besser, who served as acting director of the CDC during the swine flu outbreak. "It's one of the reasons we have a vested interest in helping to control outbreaks where they start." At least 112 people have been sickened by the Ebola outbreak, which is thought to have emerged in the forests of southern Guinea before spreading to the country's capital, Conakry. Neighboring Liberia and Sierra Leone have reported two suspected cases each - three of them fatal and all four acquired in Guinea. And Senegal has closed its border with Guinea indefinitely. The World Health Organization has yet to impose any travel restrictions on the area, stressing that it's "highly unlikely" for the outbreak to spread by plane. "The people who get Ebola tend to be in removed villages and tend not to have the money to be able to get on planes," WHO spokesman Gregory Hartl said, adding that it's equally unlikely for an American traveler to bring the disease back. "They would be probably be aware of the situation going into it and be advised not to touch someone who looks ill and feverish." Nevertheless, the CDC has urged travelers to avoid contact with blood and body fluids from people who might be infected and to seek immediate medical care seek medical care for symptoms of the hemorrhagic fever, which include fever, headache, sore throat, vomiting, diarrhea, rash and red eyes.